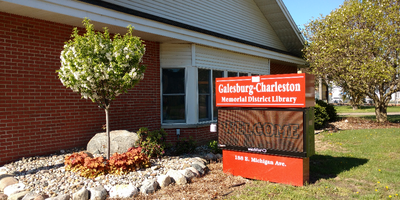 Library cards will be issued to any resident of the City of Galesburg, Charleston Township (except Village of Augusta taxpayers), and Pavilion Township (except those living within Portage Public Schools district). Proof of identify and residence are required. Acceptable forms of identity include a state issued Driver's License or ID card with a current local address. New residents may use a signed lease or mortgage, or "official" mail (bank statement, utility bill, DHS correspondence) for proof of residency. Minor children (17 years of age and younger) may obtain a library card with parent/guardian signature, and proof of identity and residence. The signing adult is financially responsible for all items checked out on minor's card. Residents of Comstock Township, Ross Township, Augusta, or Richland will be issued a GCMDL "MiCard." Proof of identity and home library card are required. Persons living outside the service area may purchase a library card for $25 annually. Books, audiobooks and magazines may be checked out by library patrons for a period of two weeks (14 days). DVDs and Blu-Ray discs may be checked out for one week (7 days). E-books and E-audiobooks may be downloaded by patrons for a period of two weeks (14 days). There is no renewal. Patrons may download book again, if desired. Reference materials may circulate at the discretion of the Director. DVDs and Blu-ray discs are NOT Renewable - a late fee of $0.25 per item, per day will be charged. If an item is lost, or damaged enough that it cannot be repaired and returned to circulation, the borrower will be charged the cost of the item. Replacement items in lieu of fines may be accepted at the discretion of the Director, provided the item is an exact duplicate of the lost or damaged item. A $3.00 processing fee will also be charged to cover the supplies and staff time expended.